Invictus is a sports drama that came out in 2009. It is a movie that shows viewers a period of time in the life of South African president Nelson Mandela. The movie documents the rise of the 1995 South African rugby world cup championship team. 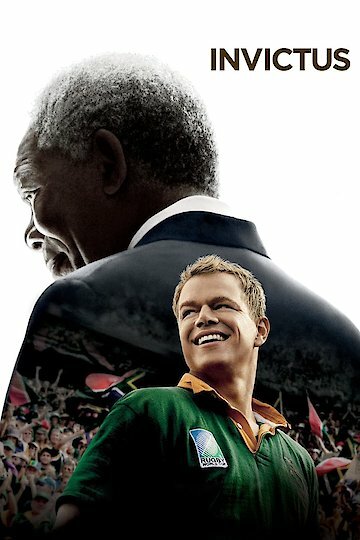 During this film, viewers will also get an inside look at the political life of Nelson Mandela and the lifestyle of the key players on the rugby team. Nelson Mandela is released from prison in South Africa. He then wins the latest election and becomes president of the nation. The country has some significant issues, such as crime and a slow economy. During this time, Mandela is also aware of the fact that the unity in the country is lacking. He looks to sports to help unite the country. The sport he looks to help unite the country is rugby. Unfortunately for South Africa, the national rugby team is very mediocre and has lost numerous games in the international matches. With the 1995 Rugby World Cup coming, things don’t look very promising for the national team. Things are so bad for the national team that in a match against another country, quite a few of the South Africans were rooting for the other countries’ national team. However President Mandela is not deterred and still has faith in the team. Over time the South African team gets better, and their overall play improves. When the World Cup begins, they start winning their games and become the surprise team in the tournament. As they advance to the final round, they are scheduled to face New Zealand. The New Zealand team is arguably the best team in the tournament and was likely favored to win the match. However, South Africa surprises everyone and makes the final match competitive. In a dramatic game, South Africa defeats New Zealand and wins the 1995 Rugby World Cup. The fans of South Africa celebrate and are ecstatic about the victory since it was won on their home soil. This uplifts the nation and helps establish President Nelson Mandela’s national credibility. Invictus is currently available to watch and stream, download, buy on demand at Amazon Prime, HBO NOW, Amazon, Vudu, Google Play, iTunes, YouTube VOD online.